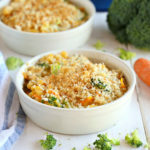 This Easy 15-Minute Vegetarian Macaroni and Cheese is the perfect quick and easy weeknight meal idea! It's packed with veggies and it's kid-friendly! Set your oven to preheat to 400 degrees Fahrenheit and quickly grease 4 small baking dishes or ramekins with butter or cooking spray (crème brulee dishes work great!). Heat a small pot over medium heat and add the butter to melt. Add the flour and whisk together, continuing to whisk over the heat for one minute. Turn the heat to low and add the milk in a slow, steady stream, whisking constantly so the mixture gets nice and thick and smooth. Add the salt and pepper and Sriracha, stirring until combined. Stir in the cheese until it melts into the smooth sauce. Turn off the heat and set the cheese sauce aside. Prepare the Barilla Ready Pasta according to the package directions (vent the package and cook for only one minute!). Stir the cooked Barilla Ready Pasta and the chopped veggies into the cheese sauce. Divide the macaroni and cheese evenly between the baking dishes. Stir the breadcrumbs and melted butter together in a small bowl and sprinkle the mixture over the tops of the macaroni and cheese in the baking dishes. Bake for about 7-8 minutes at 400 degrees Fahrenheit until the tops are golden brown and the cheese is bubbly.